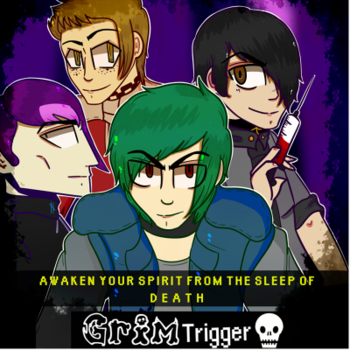 Grim Trigger is a webcomic/point-and-click game hybrid about a resistance movement in an alternate universe. The series is made in Adobe Flash and has interactive elements as well as music and animations. The series follows 14-year old protagonist Tage Dormon as he tries to figure out the mysteries surrounding the Death armor sets. Meanwhile, a deranged, self-proclaimed emperor is convinced that he is the Grim Reaper, and is forcefully converting notable figures to his cause. Grim Trigger is character driven, and is inspired by religion, history, and ancient politics. Art Shift: Whenever there's a horror scene, the art changes from cel shading to a slightly more realistic paint-y style. Bathroom Stall Graffiti: Hunter's introduction is him writing a phone number on a bathroom stall. Clothes Make the Superman: Most of the armor set pieces are just clothing articles (or weapons). Department of Redundancy Department: The 100 Challenge Challenge and the 1000 Challenge Challenge arc. Tage: All of this for some stupid, redundant challenge? Evolving Credits: The end credits change with every new arc. Fan Fare: The "Enter Dasin" arc's theme is one of these. Fatal Flaw: Lodin's eye. He goes to great lengths to cover it up, and always changes the subject when it's brought up. Four-Philosophy Ensemble: Tage (the realist), Hunter (the optimist), Lodin (the apathetic), and Proxy (the cynic). Four-Temperament Ensemble: Tage (melancholic), Hunter (saguine), Lodin (phlegmatic), and Proxy (choleric). Hypocritical Heartwarming: In book 5, when Hunter exclaims that he's the only one that can hurt Tage. Jerk Jock: Hunter is introduced as one, but he becomes more of a Lovable Jock as his character develops. Military Coup: How Valamar overthrows the Grey Prince in book 4. National Anthem: The menu at the beginning of each book plays Deșteaptă-te, române! Peek-a-Bangs: Lodin, to cover up his eye. Sinister Scythe: Valamar uses one to intimidate Grandin. Spock Speak: Lodin talks like this. Spoiler Opening: The first volume cover spoils Hunter working with Tage. The first two credits also spoil Lodin and Proxy joining them. Story Arc: Each volume is split up into different arcs, and each arc has its own title sequence that plays in the beginning of every book. The Insomniac: The first arc in the series is the "Insomniac Arc," which is named after Tage. Villainous Cheekbones: Valamar, and, to a lesser extent, Proxy. Wolf Man: There's one in book 4. If you click on him his name is "Wolf Thing" and he tries to fight Tage. He declines.